With the release of the Millennia lineup of speakers, Canadas Axiom Audio has created quite a stir among budget-seeking audiophiles. Their $275 M3Ti not only turned the heads of quite a few enthusiasts, it turned the heads of many SoundStage! Network reviewers too. It is not just a good little loudspeaker for its price, but rather, based on sound alone, a very good speaker, period. Its an inexpensive loudspeaker without the typical inexpensive-loudspeaker flaws, having a refined sound capable of pleasing even the most discriminating listeners. Close your eyes and remain oblivious to the price (as weve done in our blind-listening tests at Canadas National Research Council), and you realize that it can compete with speakers costing much more. Add to the package the M3Ti's excellent build quality and a pleasing-looking design, and it all adds up to a winner. Then, the seemingly unspeakable happened. Axiom replaced the M3Ti with the M3Ti SE. In a world that lives by the motto if it ain't broke, dont fix it, theyve gone and changed the darn thing. And thats precisely what this follow-up review addresses. 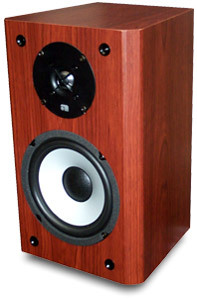 I know that there are some people out there who are hoping that the SE stands for Super Expensive -- possibly an all-out version of the M3Ti with cost-no-object drivers, wiring, crossover (what little of it there is -- theres no element on the woofer, only the tweeter), and maybe a real-wood veneer on the cabinet. These are the kind of listeners who will eschew something with a price this low on principle. I guess they listen to price tags. But that's not what the new version is about at all. The SE stands for Second Edition -- simply a refinement of the original. And, according to the company, this is not a sonic refinement, but rather a manufacturing refinement. As a result, although Axiom has changed it, pretty much everything remains the same, including the price. We contacted Amie at Axiom to find out about the SE. The most noticeable difference is cosmetic -- in particular, the front corners. According to Amie, "the small 1/8" radius has been changed to a 1/8" straight angle." If you look closely at the original speaker, the front corner rounds into the side angle and then rounds again to the side panel. Now there is a more deliberate angle, which they say makes the veneer more durable. Ian Colquhoun, the designer, says it doesn't make a single iota of difference to the sound. Another change is the sticker they use to label the back. They changed the stylized a to the whole word Axiom. I never even noticed the original sticker! Finally, Axiom improved the owners manual. Perhaps this will affect the sound -- if it tells you how to set the speakers up better. The 6.5" aluminum-cone woofer and the 1" titanium-dome tweeter remain the same, as does everything else, like the cabinets size and weight along with the companys tapered-to-the-back design -- something they call Anti Standing Wave (ASW for short). Frankly, when we heard that Axiom went from regular to an SE iteration and then learned that this was all they changed, we were surprised they renamed the speaker at all. Manufacturers usually reserve the right to make minor adjustments to their products if they find ways they can improve them. But the changes here are minor in our book. Usually a version change is a more drastic alteration. Still, to make sure that was all that changed, we actually bought a new pair to have here as a budget reference and confirm that they sound the same. This time, the Boston-cherry finish arrived. The black looks very sharp, but this new finish looks much more elegant. In fact, those hoping for an all-wood cabinet may stop hoping when they see these. You have to look very close to know its not real wood. I placed the M3Ti SE speakers atop 24" Osiris stands and hooked them up to the Roksan Kandy KA-1 integrated amp and Audio Aero Prima 24/192 CD player. I played the speakers a few hours before beginning serious audition. Some people have made considerable amounts of noise about breaking the speakers in for exorbitant amounts of time, like hundreds of hours (a lethargic, sometimes dull sound is attributed to non-broken-in speakers by some). However, I found a few hours to be sufficient. I hear no real difference between these and the originals -- a good thing and probably no real surprise given that the company said I should expect just that. In fact, had Axiom been able to improve the sound of the original M3Ti and keep the price the same, I would have been astounded, since what they gave you in the old version, and in this new one, is just so remarkable anyway. Let me touch on that again. Ive heard some small, inexpensive speakers that sound good because of what they dont give you rather than what they do. For example, a subdued, rolled-off top end can be used to minimize a particularly nasty-sounding tweeter. Or perhaps a strategically placed bass hump will be employed to hide an obvious deficiency in the low end. 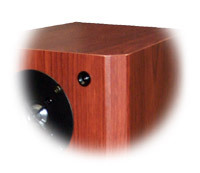 The midrange may be recessed to give a more distant character, or bumped up to give the sound more immediacy. But the M3Ti is guilty of none of these sins. Its not the last word in neutrality, but it is surprisingly natural in its presentation. It has soaring, extended highs that never fatigue the listener and quite extended bass, given the small size of its box. No, this speaker wont shake the foundation, but like many others, I have found that the reasonably rich and surprisingly weighty bottom is sufficient for most music. For movies (or bass freaks), that might not be true. In that case, it would be wise to add a subwoofer or move up to something like the companys bigger speakers. But what really sets this speaker apart -- and I mean really sets it apart -- is its midrange performance. It has an exceedingly clear, you-are-there presentation that can fool you into thinking you are listening to a speaker thats far more expensive. Whats more, the M3Ti SE has tremendous detail and transparency and can image like crazy. From one side to the other, its soundstage is holographically arrayed with outstanding precision. This is the kind of thing audiophiles lay down huge cash for. And the Axiom's depth of stage can be equally amazing. I played Ani DiFrancos "Everest" from Up Up Up Up Up Up [Righteous Babe Records RBR013], and her voice hovered so solidly in the stage and was so clear in its delivery that I could easily compare the M3Ti SEs to some hyper-expensive speakers Ive auditioned over the years. In fact, in many cases, these would win. Sarah Sleans piano and voice on her self-titled album [WEA/Atlantic 2 83502] sounds remarkably natural and full. The M3Ti SE doesnt take anything away; it shows you an amazing amount -- all for under 300 bucks! Its enough to make audiophiles who have spent multiples of that shiver in their shoes. Thats why its so special. For all intents and purposes, according to my eyes and ears, whether you have the older M3Ti or the newer SE version, you have basically the same speaker. So if you own the original, dont go out and buy the SE thinking it will be better. In fact, maybe the older M3Ti will be something of a collectors model because it will be rarer now. But if you dont have either speaker, make sure to check them out if youre shopping in this price range. Axiom has fashioned a petite, attractive, inexpensive speaker that achieves an amazingly high level of performance. The original M3Ti and its SE successor get our highest recommendation.